Below is a checklist of every animated feature released theatrically in the United States, in order of release, from 2005 to 2015. Written & compiled by Jerry Beck. 314. APPLESEED (1/14/05) Geneon. (Japan) 103 mins. (Rotoscope) D: Shinji Aramaki. From the ashes of a postapocalyptic wasteland, the city of Olympus wages war against rebels who wish to oppose their plans for mechanical clones known as Bioroids. This film follows the action from the point of view of a young girl, Deunan Knute, who’s past holds the key to resolving the current conflict. Box office gross (as of 1/23/05): $108,050. 315. POOH’S HEFFALUMP MOVIE (2/11/05) Disney. 67 mins. D: Frank Nissen. Fearful of a dreaded Heffalump, the Hundred Acre Wood crew sets forth to capture the creature — while separately, little Roo makes friends with one of them, a young one named Lumpy. Box office gross (as of 4/10/05): $18,098,433. 316. ROBOTS (3/11/05) 20th Century-Fox. 89 mins. (computer animation) D: Chris Wedge, Carlos Saldanha. In a world populated by robots, a young inventor named Rodney Copperbottom teams up with a rag-tag group of outmoded mechanical men to take on a mega-corporation threatening their very existence. Box office gross (as of 7/28/05): $128,067,343. 317. STEAMBOY (3/18/05) Triumph Pictures. (Japan) 140 mins. D: Katsuhiro Otomo. In Victorian England, young Ray Steam is entrusted with a “steam ball”, an incredible invention at the heart of a feud between his power-mad father and eccentic reclusive grandfather. (English dub also released theatrically at 128 mins.) U.S. Box office gross (as of 4/17/05): $410,388. 318. MADAGASCAR (5/27/05) Dreamworks. (computer animation) 86 mins. D: Eric Darnell, Tom McGrath. Four pampered city zoo animals are shipped back to their homeland by an animal rights organization that feels they belong in the wild. When their ship capsizes, the animals find themselves stranded in the strange jungles of Madagascar. U.S. Box office gross (as of 10/12/05): $193,187,569. 319. HOWL’S MOVING CASTLE (6/10/05) Disney. 119 mins. D: Hayao Miyazaki. A young girl named Sophie is transformed into an old woman by a witch with a sinister reputation. She seeks help from the mysterious Wizard Howl and joins his crew as caretaker on his inter-dimensional moving castle. U.S. Box office gross (as of 7/28/05): $4,711,096. 320. VALIANT (8/19/05) Disney. (computer animation) 76 mins. D: Gary Chapman. A pigeon named Valiant dreams of being a messenger homing pigeon for the Royal Air Force during WWII. U.S. Box office gross (as of 10/9/05): $19,229,436. 321. CORPSE BRIDE (9/23/05) Warner Bros. 78 mins. D: Tim Burton, Mike Johnson. Stop-motion puppets. A nervous young man is whisked away to the underworld and wed to a mysterious Corpse Bride, while his real bride waits bereft in the land of the living. Full on screen title is Tim Burton’s Corpse Bride U.S. Box office gross (as of 12/15/05): $53,359,111. 322. WALLACE & GROMIT: THE CURSE OF THE WERE-RABBIT (10/5/05) Dreamworks. Clay animation. 85 mins. D: Nick Park, Steve Box. With only days to go before the annual Giant Vegetable Competition, Wallace & Gromit, running a “humane” pest control business, have to deal with a home filled with captive rabbits – and a huge, mysterious “beast” that has begun attacking the town’s sacred vegetable gardens at night. Winner, Academy Award – Best Animated Feature. U.S. Box office gross (as of 12/31/05): $56,110.897. 323. CHICKEN LITTLE (11/4/05) Disney. (computer animation) 81 mins. D: Mark Dindal. A young chicken mistakes a falling acorn for a piece of the sky and causes a mass panic. Humiliated, he revives his reputation, becoming a little league baseball champ. When another piece of the sky lands on his head and he discovers it’s part of an alien invasion, Chicken Little knows he’s the only one who can stop an assault from outer space. Domestic U.S. Box office gross (as of 1/19/06): $133,270,228. 324. HOODWINKED (12/16/05) The Weinstein Company. (computer animation) 80 mins D: Cory Edwards, Todd Edwards, Tony Leech. The supposed true story of the details surrounding the fable of Red Riding Hood. Domestic U.S. Box office gross (as of 2/20/06): $51,386,61. NOTE #1: FOR THE RECORD: Pentamedia released GULLIVER’S TRAVEL (India, CGI, 70 mins. directed by Anita Udeep) in Los Angeles to qualify for an Academy Award. NOTE #2: Begining in 2004, with Spookley The Square Pumpkin, Kidtoon Films (a division of SD Entertainment) began releasing direct-to-video animated features to theatres, digitally projected, in limited release weekend matinees. They usually released these films a few weeks before their video debut, taking ads in local papers. These films were never intended as theatrical releases, no 35mm film prints were struck, no trailers exist. None of these films recieved legitimate reviews in local papers or industry trade papers. Thus, I do not consider these films legitimate theatrical releases. NOTE #3:For the record, in 2005 Kidtoon Films released CANDY LAND: THE GREAT LOLLIPOP ADVENTURE on February12th, THE GOLDEN BLAZE on April 2nd, TOM & JERRY: THE FAST AND THE FURRY on September 3rd, MY LITTLE PONY: A VERY MINTY CHRISTMAS on October 8th, SCOOBY DOO! IN WHERE’S MY MUMMY? on November 5th and NODDY SAVES CHRISTMAS on December 10th. 340. HAIR HIGH (10/18/06) Plymptoons Releasing. 75 mins. D: Bill Plympton. A gothic ’50s high-school comedy about a love-triangle that goes terribly bad, as two young, murdered teens returning to their prom to get revenge. Date listed is official New York release date (film was screened at festivals throughout 2004 & 2005 – West Coast premiere 2/14/05 at San Francisco Independent Film Festival. East Coast premiere 3/5/05 at the Florida Film Festival in Maitland FL). 341. ROMEO AND JULIET: SEALED WITH A KISS (10/27/06) Indican Pictures. 77 mins. D: Phil Nibbelink. Two seals from warring families fall in love against their parents’ wishes. Box office gross (as of 12/10/06): $173,097. 342. FLUSHED AWAY (11/03/06) Dreamworks (Aardman). (computer animation) 84 mins. D: Sam Fell, Henry F Anderson, III, David Bowers. A pampered British rat accidentally gets flushed from his posh penthouse flat into the slimy London sewers. Box office gross (as of 12/12/06): $61,285,173. 343. HAPPY FEET (11/17/06) Warner Bros. (computer animation) 108 mins. D: George Miller. A penguin named Mumble needs his own special song to attract a soul mate. However, he is the worst singer in the world… but he can tap-dance something fierce! Winner, Academy Award – Best Animated Feature. Box office gross (as of 12/12/06): $139,344,614. 344. PAPRIKA (11/20/06) Sony Pictures Classics. (Japan) 91 mins. D: Satoshi Kon. A group of scientists develop a new psychiatric tool known as the DC Mini, a device which allows doctors to enter directly into their patient’s dreams, interacting with them to diagnose and treat any issues the dream may suggest. Release date listed is for Oscar qualifying Los Angeles thearical engagement (at Laemmle Grand 4 Theatre). General release date is May 25, 2007. 345. ARTHUR AND THE INVISIBLES (12/15/06) MGM. (computer animation) 103 mins. D: Luc Besson. A boy (Arthur) sets out to save his family by enlisting the help of a tribe of mysterious little people, so tiny they are considered invisible. Once in their magical land, Arthur must join swords with a beautiful princess and an army of defenders to help save their land from the evil wizard. NOTE: Partial live action. NOTES: FOR THE RECORD: In 2006 Kidtoon Films has released: MY LITTLE PONY: THE PRINCESS PROMENADE (1/14/06) and PINOCCHIO 3000 (4/8/06). ARTHUR AND HIS MISSING PAL opened in July, MY LITTLE PONY: RUNAWAY RAINBOW was released August 26th and STRAWBERRY SHORTCAKE: THE SWEET DREAMS MOVIE played in October. In 2006, Funimation Film teaming with Kidtoon Films released anime features, under the BIGGER FILMS banner, via digital projection, to U.S. art theatres starting with DRAGONBALL Z: FUSION REBORN on 3/16/06. This direct-to-video movie was originally released in Japan in 1995. This title was featured in ads & posters, but was paired theatrically with DRAGONBALL Z MOVIE 06: THE RETURN OF COOLER (2002). FUNIMATION also released BASILISK THE BEGINING on 4/7/06, and TRINITY BLOOD: GENESIS on 5/6/06. FULLMETAL ALCHEMIST THE MOVIE: CONQUEROR OF SHAMBALLA was released to one theatre (The Bridge in Los Angeles) on August 25th. 355. THE TEN COMMANDMENTS (10/19/07) Promenade Pictures. (computer animation) D: John Stronach and Bill Boyce. Moses is touched by God and told that he will lead his enslaved Chosen People to the Promised Land. With the hand of God firmly on his shoulder, and with faith as his only weapon, Moses performs miracles, casts down plagues, evades a pursuing Egyptian army and parts the Red Sea. Ben Kingsley, Elliot Gould, Christian Slater, Alfred Molina are voices. Box office gross (as of 11/19/07): $952,820. 356. BEE MOVIE (11/2/07) Dreamworks/Paramount. (computer animation) D: Steve Hickner, Simon J. Smith. Barry B. Benson (Jerry Seinfeld) is disillusioned at his lone career choice: making honey. His life is saved by a florist and, as their relationship blossoms, he discovers people actually eat honey, and subsequently decides to sue the human race. Box office gross (as of 12/20/07): $122,651,629. 357. BEOWULF (11/16/07) Paramount. (motion capture/computer animation) D: Robert Zemeckis. The mighty warrior Beowulf comes to Heorot, to battle the demon Grendel, a monstrosity who terrorizes the hall. What he does not expect is the hellish wrath of the beast’s ruthlessly seductive mother. (initial release in both 3-D and flat) Box office gross (as of 12/20/07): $80,046,402. 358. PERSEPOLIS (12/25/07) Sony Pictures Classics. D: Vincent Paronnaud, Marjane Satrapi. Poignant coming-of-age story of a precocious and outspoken young Iranian girl that begins during the Islamic Revolution. 2-D in black & white. Nominated for an Academy Award for Best Animated Feature. Box office gross (as of 03/23/08): $4,096,000. NOTES: Though a significant box office hit, I do not consider ALVIN AND THE CHIPMUNKS a purely animated film (it’s 50% live action). It’s a hybrid, following in the footsteps of the SCOOBY DOO, CASPER and GARFIELD live action movies. In 2007, Funimation Films (teamed with Kidtoon Films) released the anime feature Robotech: The Shadow Chronicles on January 5th in Portland OR, Indianapolis IN, and February 3rd in LA. KidToon Films also released Little Robots in The Big Show on Feb. 3rd, and Strawberry Shortcake Berry Blossom Festival on March 3rd. For a complete list of KidToon releases go here. Viz Media (through NCM Fathom) released Naruto the Movie: Ninja Clash in the Land of Snow on June 6th as a one night only event. 359. THE PIRATES THAT DON’T DO ANYTHING (01/11/08) Universal. (computer animation) D: Mike Nawrocki. A VeggieTales Movie. Elliot (Larry the Cucumber), Sedgewick (Mr. Lunt) and George (Pa Grape) dream of the day of putting on a show about pirates. They soon find themselves traveling back in time into the 17th century and learn about being pirates first hand, beginning a quest to rescue a royal family from an evil tyrant. Box office gross (as of 03/06/08): $12,727,025. 360. HORTON HEARS A WHO (03/14/08) 20th Century-Fox. (computer animation) D: Jimmy Hayward, Steve Martino. Based on the Dr. Seuss story, Horton the Elephant struggles to protect a microscopic community from his neighbors who refuse to believe it exists. Box office gross (as of 08/05/08): $154,444,322. 361. KUNG FU PANDA (05/23/08) Dreamworks/Paramount. (computer animation) D: Mark Osborne, John Stevenson. A lazy, irreverent slacker panda, Po, must somehow become a Kung Fu Master in order to save the Valley of Peace from a villainous snow leopard, Tai Lung. Nominated for an Academy Award – Best Animated Feature. Box office gross (as of 10/10/08): $215,422,559. 362. WALL-E (06/27/08) Pixar/Disney. (computer animation) D: Andrew Stanton. In the year 2700, WALL-E, a waste disposal robot, spends every day doing what he was made for. But one day he meets a new robot and falls in love. Winner of Academy Award – Best Animated Feature. Box office gross (as of 10/10/08): $221,127,808. 363. SPACE CHIMPS (07/18/08) 20th Century-Fox. (computer animation) D: Kirk De Micco. Ham III, the grandson of the first chimp astronaut, is blasted off into space with the mission to rid a far-away planet of their nefarious leader. Box office gross (as of 10/10/08): $29,961,096. NOTES: Nina Paley self distributed SITA SINGS THE BLUES to film festivals around the world – its first US screening was at the Tribeca Festival in New York on 4/25/08. Disney released TINKER BELL, a made-for-video movie, on September 19th at the El Capitan Theatre in Hollywood, as a two week promotion for the film’s DVD release. NCM FATHOM, the entertainment division of National CineMedia, released the Japanese anime film BLEACH THE MOVIE: MEMORIES OF NOBODY in more than 300 theatres across the country on June 11th and 12th. 379. CORALINE (2/6/09) Focus Features. (stop-motion puppets) D: Henry Selick. A young girl walks through a secret door in her new home and discovers an alternate version of her life. Box office gross (as of 07/05/09): $75,286,229. Nominated for an Academy Award – Best Animated Feature. 382. UP (5/29/09) Disney/Pixar. D: Pete Docter, Bob Peterson. By tying thousands of balloon to his home, 78-year-old Carl Fredricksen sets out to fulfill his lifelong dream to see the wilds of South America. He soon learns he isn’t alone on his journey. U.S. Box Office Gross as of September 24th: $291,899,682. 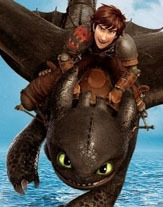 Nominated for several Academy Awards – including Best Picture and Best Animated Feature. NOTES: SITA SINGS THE BLUES played Ebertfest in Chicago (4/09) and Nina Paley self-released the film on DVD on July 28th. SITA SINGS THE BLUES was officially released theatrically in New York on December 25th. Family 1 Films released THE VELVETEEN RABBIT, a live action/2D animation combination movie, on February 20th in selected cities, as a two week promotion for the film’s DVD release. Hybrid films (live action/CGI) released this year include G-FORCE (7/24 from Disney), ALIENS IN THE ATTIC (7/31 from Fox) and ALVIN AND THE CHIPMUNKS: THE SQUEAKUEL (12/25 from Fox). Film Roman/Starz Media’s direct-to-video Rob Zombie cartoon feature, THE HAUNTED WORLD OF EL SUPERBEASTO, played theatrical midnight shows around the country on September 12th. Disney theatrically re-released TOY STORY and TOY STORY 2 in 3D on October 2nd. To qualify for an Oscar, Disney played the direct-to-video feature TINKER BELL AND THE LOST TREASURE for one week at El Capitan in Hollywood, CA, October 16-22. 409. IDIOTS AND ANGELS (8/06/10) Plymptoons. D: Bill Plympton. Angel, a selfish and morally bankrupt man, wakes up one morning with wings on his back. NOTES: To qualify for an Oscar, Disney played the direct-to-video feature TINKER BELL AND THE GREAT FAIRY RESCUE for ten days at El Capitan in Hollywood, CA, September 3rd thru September 19th. The Weinsten Company did not release HOODWINKED TOO! HOOD VS. EVIL in 2010, despite Kiddie Meal toys offered at Burger King. The fate of this film is still being decided. The Academy qualified “Cats & Dogs: The Revenge of Kitty Galore” as an animated feature. It was a hybrid production of live action and CG animation and is not listed here. YOGI BEAR – a hybrid of CG and live action, was released 12/17. Significant cartoon-hybrid films released each year will be listed along with pure animated films from this point on. 422. MIA AND THE MIGOO (05/06/11) GKids. D: Jacques-Remy Girerd. (French – Hand Drawn Animation) On her quest to find her father, Mia befriends the mysterious Migoo and together they save planet earth from ecological disaster. 424. THE LION OF JUDAH (6/3/11) 87 mins. Rocky Mountain Pictures. D: Deryck Broom. A spunky lamb, who thinks himself a lion, is destined for slaughter during Passover services in Jerusalem. When he’s shipped off to the city, his barnyard friends set off to rescue him. 432. REDLINE (12/2/11) Manga. D: Takeshi Koike. (hand drawn anime). An action drama centered on a deadly racing tournament held every five years and the reckless dare-devil driver who wants to win it. 433. WRINKLES (12/9/11) Perro Verde Films. D: Ignacio Ferreras. (hand drawn). Emilio, in the early stages of Alzheimer, is helped by Miguel and colleagues to avoid ending up on the feared top floor of the care home, also known as the lost causes or “assisted” floor. NOTES: FOR THE RECORD: In 2012 GKids Films released: ZARAFA, A LETTER TO MOMO, THE RABBI’S CAT and THE PAINTING. Other foreign releases opening in LA to qualify for Oscar consideration include ADVENTURES IN ZAMBEZIA, THE MYSTICAL LAWS, A LAIR’S AUTOBIOGRAPHY, HEY KRISHNA, DEHLI SAFARI and WALTER AND TANDOORI’S CHRISTMAS. NOTES: IS THE MAN WHO IS TALL HAPPY? (Sundance Selects) an animated documentary about Noam Chomsky, directed by Michel Gondry and APPROVED FOR ADOPTION (GKids) an animated documentary about a Korean orphan, directed by Laurent Boileau opened in Los Angeles on November 22nd. PULLA MAGI MADOKA MAGICA THE MOVIE: REBELLION opened in LA on December 6th for a one-week Oscar qualifying engagement. 477. SHORT PEACE (4/18/14) Eleven Arts. D: Katsuhiro Otomo, Shuhei Morita, Hiroaki Ando, Hajime Katoki. An anime anthology of four films including the Oscar nominated Possessions and Otomo’s Combustible. 480. POSTMAN PAT: THE MOVIE (6/27/14) Timeless Films (Classic Media/Shout Factory). D: Mike Disa. In this film, based on a popular pre-school TV character, a veteran postman finds his beliefs challenged after he enters a TV talent show competition. 485. THE TALE OF THE PRINCESS KAGUYA (10/17/14) GKids (Studio Ghibli). D: Isao Takahata. Found inside a shining stalk of bamboo, a tiny girl grows into an exquisite young lady, raised by an old bamboo cutter and his wife. Ultimately she must face her secret fate. 486. BOOK OF LIFE (10/17/14) 20th Century Fox. D: Jorge R. Gutierrez. Manolo is a young man torn between fulfilling the expectations of his family and following his heart. Before choosing which path to follow, he embarks on an incredible adventure that spans three fantastical worlds where he must face his greatest fears. 487. BIG HERO 6 (11/7/14) Disney (Marvel). D: Don Hall and Chris Williams. With the help of enhanced outfits, a teenage robotics expert named Hiro, along with a healthcare robot (Beymax) and four scientific geniuses become super heroes and go after a mysterious villain who may have killed his brother. 488. GIOVANNI’S ISLAND (11/7/14) Production I.G. D: Mizuho Nishikubo. (anime) Two children from opposite sides of the border develop a friendship in the aftermath of a devastating conflict. 489. THE PENGUINS OF MADAGASCAR (11/26/14) 20th Century Fox (Dreamworks). D: Eric Darnell and Simon J. Smith. 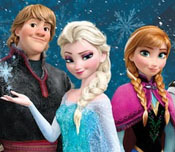 Skipper, Kowalski, Rico and Private join forces with undercover organization The North Wind to stop the villainous Dr. Octavius Brine from destroying the world as we know it. 490. SONG OF THE SEA (12/16/14) GKids. D: Tomm Moore. An Irish youth discovers that his mute sister is a selkie who must find her voice and free supernatural creatures from the spell of a Celtic goddess. NOTES: This year there was an explosion of limited release animated features – billboarding their DVD, VOD or Digital release. THE PIRATE FAIRY, a “Tinkerbell” direct-to-video feature directed by Peggy Holmes, was theatrically released by Disney on February 28th. It played the El Capitan Theatre in Hollywood California for a three-week engagement. WAR OF THE WORLDS: GOLIATH (Anderson Digital), directed by Joe Pearson, opened March 7th in New York and Los Angeles, day and date with VOD and iTunes. Anime feature TIGER AND BUNNY THE MOVIE: THE RISING (Eleven Arts/Viz) opened theatrically in 21 cities on March 14th. Eleven Arts opened the anime feature K MISSING KINGS in 52 theaters on July 18th. Shout! Factory and Screenvision released SLUGTERRA: RERTURN OF THE ELEMENTALS across the U.S beginning August 2nd. Funimation released DRAGON BALL Z: BATTLE OF THE GODS to theaters for four days (August 5, 6, 7 and 9). Paramount released the hybrid live action/animated TEENAGE MUTANT NINJA TURTLES on August 8th. Reveal 42 Animation Studios released the 67-minute hand-drawn baseball-themed animated feature HENRY AND ME, directed by Barrett Esposito, to theaters in New York City on August 18th and in L.A. on September 5th (preceding its September 9th DVD release date). Eleven Arts put ROAD TO NINJA – NARUTO THE MOVIE in theaters on August 29th. Shout! Factory theatrically released French-made THUNDER AND THE HOUSE OF MAGIC, directed by Ben Stassen and Jeremie Degruson, on September 5th, 2014. French CG animated feature JACK AND THE CUCKOO-CLOCK HEART, directed by Mathias Malzieu and Stéphane Berla, was released theatrically by Shout Factory on September 24th. Shout! Factory and Screenvision also released MY LITTLE PONY EQUESTRIA GIRLS in 300 theaters on September 27th. Magnolia Pictures theatrically released THE HERO OF COLOR CITY (directed by Frank Gladstone) day and date with VOD release on October 3rd. Wreckin Hill Entertainment opened YELLOWBIRD (directed by Christian De Vita) in several U.S. cities (including Detroit) on December 5th. 491. PADDINGTON (1/16/15) The Weinstein Company. D: Paul King. After a deadly earthquake destroys his home in Peruvian rainforest, a young bear makes his way to England in search of a new home. The bear finds shelter with the family of Henry and Mary Brown, though a wicked taxidermist who has designs on his hide. 492. STRANGE MAGIC (1/23/15) Touchstone. (Lucasfilm) D: Gary Rydstrom. Bog King, leader of the Dark Forest, hates the notion of love and has ordered the destruction of all primroses, which are an essential ingredient of love potions. However, when he meets a pixie named Marianne he begins to change his mind. 493. 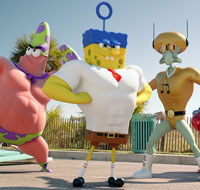 SPONGEBOB SQUAREPANTS MOVIE 2: SPONGE OUT OF WATER (2/13/15) Paramount (Nickelodeon). D: Paul Tibbitt, Mike Mitchell. When a diabolical pirate above the sea steals the secret Krabby Patty formula, SpongeBob and his nemesis Plankton must team up in order to get it back. 494. HOME (3/27/15) 20th Century Fox (Dreamworks). D: Tim Johnson. An alien on the run from his own people makes friends with a girl. He tries to help her on her quest, but can be an interference. 495. WHEN MARNIE WAS THERE (5/22/15) GKids (Studio Ghibli). D: Hiromasa Yonebayashi. (anime) A girl is sent to the country for health reasons, where she meets an mysterious new friend in the form of Marnie, a young girl with flowing blonde hair. 496. 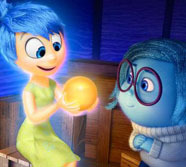 INSIDE OUT (6/19/15) Disney (Pixar). D: Peter Docter. After young Riley is uprooted from her Midwest life and moved to San Francisco, her emotions – Joy, Fear, Anger, Disgust and Sadness – conflict on how best to navigate a new city, house, and school. 497. 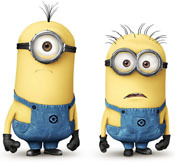 MINIONS (7/10/15) Universal (Illumination). D: Pierre Coffin, Kyle Balda. Minions Stuart, Kevin and Bob are recruited by Scarlett Overkill, a super-villain who, alongside her inventor husband Herb, hatches a plot to take over the world. 498. SHAUN THE SHEEP (8/7/15) Lionsgate. D: Mark Burton, Richard Starzak. Shaun and the flock travel to the Big City to retrieve the Farmer, who has lost his memory and has become a famous hairdresser. 499. KAHLIL GIBRAN’S THE PROPHET (8/7/15) Gkids. D: Roger Allers (with vignettes directed by Tomm Moore, Bill Plympton, Joan Gratz, Nina Paley, Joann Sfar, Paul and Gaetan Brizzi, Michael Socha and Mohammed Harib). A dissident being kept under house arrest recounts valuable lessons in a series of vignettes while a mischievous young woman causes trouble in her town. 500. HUEVOS LITTLE ROOSTER’S EGG-CELLENT ADVENTURE (9/4/15) Pantelion Films (via Lionsgate) D: Gabriel Riva Palacio Alatriste. Toto, a young chick born the run of the litter, rises to the occasion when a rancher threatens his home and his family. (Released theatrically, in Spanish, in the U.S. as UN GALLO CON MUCHOS HUEVOS). 501. HOTEL TRANSYLVANIA 2 (9/25/15) Sony. D: Genndy Tartakovsky. Drac is secretly worried that his half-human grandson isn’t showing his vampire side, so he enlists his friends to help him put the boy through a “monster-in-training” boot camp. 502. HELL AND BACK (9/25/15) Freestyle Releasing. (stop-motion) D: Tom Gianas and Ross Shuman. Two best friends set out to rescue their pal after he’s accidentally dragged to hell. 503. THE PEANUTS MOVIE (11/6/15) 20th Century Fox (Blue Sky). D: Steve Martino. Life for Charlie Brown gets complicated as he hopes to impress his new neighbor, the Little Red-Haired Girl. Meanwhile, Snoopy woos a female beagle, Fifi, while on patrol against The Red Baron. 504. THE GOOD DINOSAUR (11/25/15) Disney (Pixar). D; Peter Sohn. An epic journey into the world of dinosaurs where an Apatosaurus named Arlo makes an unlikely human friend. 506. MOOMINS ON THE RIVIERA (12/04/15) Handle Productions. (hand drawn) D: Xavier Picard and Hanna Hamilä. 507. BOY AND HIS WORLD (12/11/15) GKids. (hand drawn) D: Alê Abreu. 508. ANOMALISA (12/30/15) Paramount. (stop motion) D: Duke Johnson, Charlie Kaufman. A disillusioned author, during a speaking engagement in Cincinnati, meets a girl at his hotel whom he thinks is different from everyone else in his life. NOTES: Limited-release Direct-to-Video (DVD, VOD) animated features began this year with the distribution by Disney of TINKER BELL AND THE LEGEND OF THE NEVERBEAST, directed by Steve Loter, which played 13 days at the El Capitan Theatre in Hollywood, California beginning January 30th. Eleven Arts released the anime feature THE LAST: NARUTO THE MOVIE to theaters in 20 cities including the Downtown Independent in L.A. and the Village East in NYC on February 20th. Shout Factory theatrically released MAYA THE BEE MOVIE, directed by Alexs Stadermann, in New York and L.A on May 1st. CJ Entertainment released BACK TO THE JURASSIC (directed by Yoon-suk Choi and John Kafka) in select theaters on June 12th. E1 released ALL CREATURES BIG AND SMALL in Los Angeles on one AMC Burbank screen on July 17th. Shout Factory opened THE SEVENTH DWARF, directed by Boris Aljinovic and Harald Siepermann on July 31st. Funimation played the anime DRAGONBALL Z: RESURRECTION F theatrically for seven days August 4th through 12th. Eleven Arts released the quasi-religious anime feature THE LAWS OF THE UNIVERSE: PART 0, directed by Isamu Imakake, on October 9th. GKids theatrically released EXTRAORDINARY TALES, directed by Raul Garcia, on October 30th the same day it is available VOD. Funimation put GHOST IN THE SHELL: THE NEW MOVIE to theaters on November 10th. And finally, it should be noted 20th Century Fox opened the hybrid live action/animation ALVIN AND THE CHIPMUNKS: THE ROAD CHIP in 3,705 theaters on Dec. 18th. Continue this list into 2016 (and beyond) CLICK HERE. Go to Jerry Beck’s CARTOON RESEARCH home page.